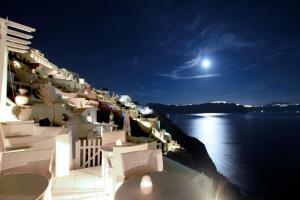 The Residence Suites offers suites and studios individually decorated on the cliff top of the town of Oia. The accommodation has a private or shared terrace or balcony with stunning views of the sea. Once the reservation is confirmed, carefully read the instructions provided by the Residence Suites before checking in at the Residence Suites. The property does not allow children under 12 years. Extra beds are available upon request. This air-conditioned room features a classic décor and a semi-private balcony or terrace with views of the Aegean Sea and the caldera. It has a small fridge, a TV and a bathroom with free toiletries and a hairdryer. Free WiFi is available in the outdoor areas. Elegant studio superior category with dining table and seating area with sofa bed. 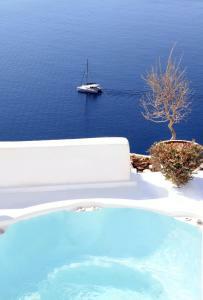 It has a private or semi-private balcony or terrace with views of the sea and the Caldera. Includes air conditioning and WiFi in the outdoor areas. Spacious, air-conditioned suite with classic, elegant décor and a semi-private balcony or terrace overlooking the Aegean Sea and the caldera. It has a living room with a TV, a small fridge and a dining area. It offers free toiletries, a hairdryer and free Wi-Fi in the outdoor areas. The honeymoon suite is large and has a living room with beautiful stone walls and a private balcony with views of the sea and the caldera. Includes WiFi in the outdoor areas, air conditioning and fridge. A free bottle of wine is offered upon arrival. Spacious suite of 2 bedrooms with air conditioning, mini fridge, classic decor and semi-private balcony or terrace overlooking the Aegean Sea and the caldera. It includes a living room with a TV and a bathroom with free toiletries and a hairdryer. Free WiFi is available in the outdoor areas. During the stay there could be a change of room. Please note that this room type can not accommodate 2 guests.